Born and raised in California, David Lago made his professional acting debut on television with a bit part as student in a 1997 episode of the acclaimed, but short-lived, series “Dangerous Minds.” He continued to guest star in an episode of the long-running comedy series “Step by Step,” starring Suzanne Somers and Patrick Duffy that same year, before landing his first film role in the Eric Robert vehicle Past Perfect (1998), playing young Dylan Cooper. The following year, Lago debuted as a regular when he was cast as Tom in the Rocky Lane/John Shepherd-written series “Redemption High,” opposite Judge Reinhold and Desirae Klein. 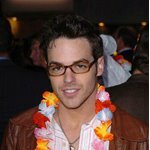 The same year, he also appeared as Adrian Rosser in one episode of “Pacific Blue.” The young actor, however, did not experience a huge break until he joined the cast of the 1973 daytime soap “The Young and the Restless” in August 1999. Impressively playing Raul Guittierez, he was nominated for a Daytime Emmy for Outstanding Younger Actor in 2000, 2001, 2003 and 2004, and won in 2005. Additionally, he picked up a 2000 Young Artist for Best Performance in a Soap Opera – Young. Lago departed “Y&R” in 2004, and the next year he could be seen starring opposite Shonda Farr in A Couple of Days and Nights, a comedy for director Vaughn Verdi. Still in 2005, the young performer had a lead role in the short/comedy movie Artistic License. The Californian native has recently completed a horror film, Dead in the Water (2006), starring Joshua Arden, Michael Harrison Baker and Becky Boxer. Currently, he is filming Hollywood Horror (2006), playing Scott. Directed by Bernt Amadeus Capra, the film also stars Kerri Randles, Todd Bridges, Alyson Croft, among others.